The Myers-Briggs Type Indicator is the most popular personality test in the world. It is used regularly by Fortune 500 companies, universities, hospitals, churches, and the military. Its language of personality types--extraversion and introversion, sensing and intuiting, thinking and feeling, judging and perceiving--has inspired television shows, online dating platforms, and Buzzfeed quizzes. Yet despite the test's widespread adoption, experts in the field of psychometric testing, a $2 billion industry, have struggled to validate its results--no less account for its success. How did Myers-Briggs, a homegrown multiple choice questionnaire, infiltrate our workplaces, our relationships, our Internet, our lives? 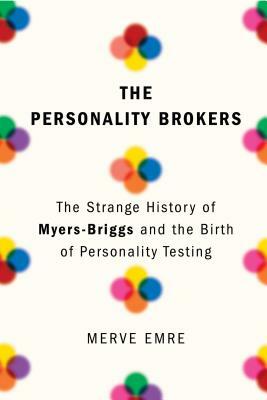 First conceived in the 1920s by the mother-daughter team of Katherine Briggs and Isabel Briggs Myers, a pair of devoted homemakers, novelists, and amateur psychoanalysts, Myers-Briggs was designed to bring the gospel of Carl Jung to the masses. But it would take on a life entirely its own, reaching from the smoke-filled boardrooms of mid-century New York to Berkeley, California, where it was administered to some of the twentieth century's greatest creative minds. It would travel across the world to London, Zurich, Cape Town, Melbourne, and Tokyo, until it could be found just as easily in elementary schools, nunneries, and wellness retreats as in shadowy political consultancies and on social networks. Drawing from original reporting and never-before-published documents, The Personality Brokers takes a critical look at the personality indicator that became a cultural icon. Along the way it examines nothing less than the definition of the self--our attempts to grasp, categorize, and quantify our personalities. Surprising and absorbing, the book, like the test at its heart, considers the timeless question: What makes you, you? MERVE EMRE is an associate professor of English at the University of Oxford. She is the author of Paraliterary: The Making of Bad Readers in Postwar America. Her work has appeared or is forthcoming in The New Yorker, Harper's Magazine, Bookforum, The New York Times Magazine, The Atlantic, The New Republic, The Baffler, n+1, and the Los Angeles Review of Books, where she is senior humanities editor. "In this riveting, far-reaching book [Emre] brings the skills of a detective, cultural critic, historian, scientist and biographer to bear on the MBTI and the two women who invented and promoted it.... She is never condescending to or dismissive of the people who find their four-dimensional profiles illuminating and helpful. That is why, when Ms. Emre describes her book as being 'for the skeptics, the true believers, and everyone in between,' she is absolutely right." "An archivally rich mix of history, biography, and a bit of reporting.... [A] close, sympathetic study of the test's creators and their aspirations." “This combined dual biography and social history seeks explanations for why an admittedly flawed, unscientifically proven personality test—created in the 1920s by a mother-daughter team of two untrained pseudointellectuals—continues to be the most revered personality indicator in existence...[T]his eye-opening account gives readers insight into how one evaluation method morphed into a neat, satisfying packaging system for our complicated psyches."